Do you recognize this well-known piece of cycling art? It is located along the peage tollway, at a rest stop in the French Pyrenees called Les Pyrénées aire. There is something thrilling about seeing this sculpture every time I pass the area. If you are driving on the A-64, and happen to see the rest stop sign for Les Pyrenees, east of Pau/west of Tarbes (you must be traveling in the eastbound direction to access this rest stop), get off the peage, go behind the gas station and walk up to the sculpture. 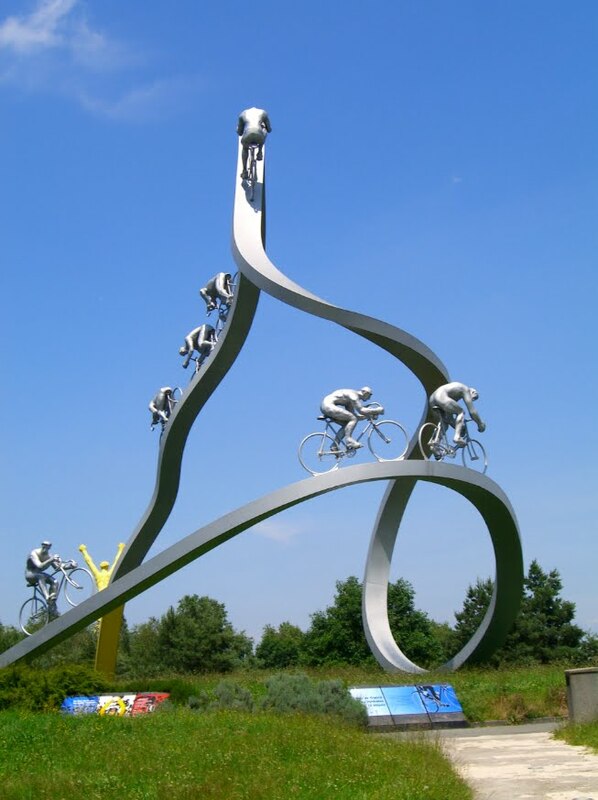 History on the bike sculpture: the 80-foot Tour sculpture entitled, “Le Tour de France dans les Pyrénées” (The Tour de France in the Pyrénées), was inaugurated in 1996 with cooperation from organizers of the Tour de France and highway officials. Designed by artist Jean-Bernard Métais (made from 30 tonnes of steel) it is located at Les Pyrénées aire. There are 12 panels around the base of the sculpture giving a history of the riders and Le Tour.